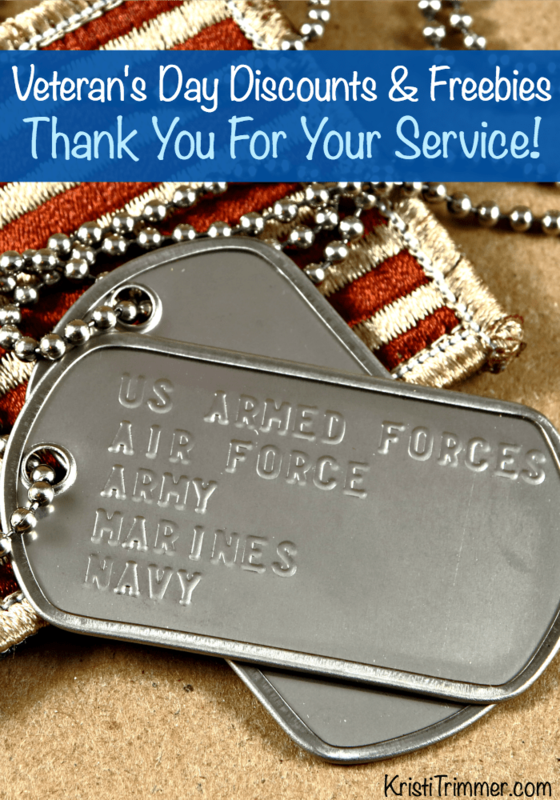 Veteran’s Day Discounts & Freebies, Thank You For Your Service! Veteran’s Day is November 11th every year in the US and the day where we honor those who have served in our military. Saying Thank You is a small gesture that doesn’t cost a dime and is appreciated by those who’ve chosen a career in uniform. I’ve rounded up places that give discounts to Veterans and Active Duty military. Thanks MidgetMomma.com for gathering the start of this list of places where Active Duty Service Members, Guard Members and Veterans can get a FREE Meal on Veteran’s Day. All places require proof of military service, which includes Military ID, Discharge Papers, DD214 or being in uniform. Note: Not all franchise locations participate in their national chain’s Veterans Day programs, double check before you head out. Applebee’s: Pick from one of 7 meals as a Thank You to service members. Available from open to close. Dine in only. Bakers Square: Veterans and active duty military get a free breakfast from a set menu on November 11. Bar Louie: From open to close Tuesday, November 10th and Wednesday, November 11th Bar Louie locations across the country will offer veterans and active military personnel a free meal up to a $12 value. BJs Restaurant and Brewhouse: Nov. 11, 2015. Free entree, up to $12.95 value. Offer valid to all active duty military and veterans, with proof of service. Bonanza Steakhouse: From 4pm-close get a free Buffet meal. California Pizza Kitchen: Nov. 11, 2015. Choose a pizza, full size salad, or pasta from the special Veterans Day Menu. Dine-in only. Please come in uniform or bring your military I.D. or other proof of service. Carraba’s: Monday Nov. 9 – Sunday Nov. 15, 2015. Free appetizer of your choice for active duty servicemembers and veterans. Military ID or proof of service required. Cattlemens Steakhouse: Nov. 11, 2015. Free 8 oz Sirloin Steak Dinner on Veterans Day. Includes all-you-can-eat salad, sourdough bread, baked potato, and ranch style beans. Proof of service required. Cheeseburger in Paradise: Nov. 11 2015. Free All-American Burger with fries with purchase of beverage and military ID or proof of service. Available to active military or veterans. Beverages and gratuity not included, dine-in only, and participating locations only. Chili’s: Is offering all military veterans past and present their choice of one of 7 meals during the dinner hour, or any lunch combo during lunch. Offer only available at participating Chili’s in the U.S. only. Dine-in from limited menu only. Claim Jumper: Nov. 9, 2015. Free entrée from select menu, with official proof of service. Dine-in only. Denny’s: Get a free Build Your Own Grand Slam breakfast on Nov. 11 from 5 a.m.- noon. Firebirds Wood Fired Grill: Active duty military and veterans get a free lunch or dinner entrée on November 11. Fox & Hound and Bailey’s Sports Grille: Nov. 11, 2015. Free Sandwich or Entree (up to $10) for active duty military and veterans with ID or proof of service. Dine-in only and at only at participating locations. Breakfast Option includes: Big-Two-Do meal, which includes a coffee and the choice between two slices of French toast, two buttermilk pancakes, or two slices of regular toast. Breakfast also comes with bacon or sausage links, and two farm fresh eggs. Lunch or dinner includes: an All-American Burger served with fries and a beverage (soda, ice tea, or hot beverage). Golden Corral: Military and Veterans can dine for free From 5pm-1opm. Gordon Biersch: Veterans and active military personnel receive a free appetizer on November 11. Hooters: All active-duty and retired military nationwide to enjoy a free meal as a thank you for their service. On Wednesday, Nov. 11, all veterans and active-duty military personnel can enjoy an entrée on the house, served up with warm Hooters Girl hospitality, by presenting a military ID or proof of service at any Hooters location across the country. Hy-Vee, Free Breakfast: Nov. 11, 2015. Free Veterans Day breakfast from 7am – 11am at all participating Hy-Vee supermarkets with in-store dining. Ihop: Free stack of Red, White & Blue pancakes – buttermilk pancakes crowned with glazed strawberries, blueberry compote and whipped topping, from 7 a.m.-7 p.m.
Krystal: From 6 -11am, on Wednesday, November 11, 2015, all active and retired military can receive a free chicken or free sausage biscuit. Additionally, from 11 am to close, everyone can take advantage of $.50 Pups and Corn Pups. LaMar’s Donuts — Veterans and active duty military get a free donut and 12 oz. coffee at participating locations on November 11. Little Caesars® Pizza: Receive their free $5 Lunch Combo, which features four slices of Little Caesars popular Detroit-style Deep Dish pizza, paired with a 20-ounce Pepsi product. Logan’s Roadhouse: In addition to the 10% military discount offered every day, military and former military guests will also receive a free dessert on November 11. McCormick & Schmick’s Seafood Restaurants: Free lunch or dinner, Sunday Nov 8, 2015: McCormick & Schmick’s is celebrating their 17th annual Veteran’s Appreciation Event on Sunday, November 8th. Veterans will be able to choose a complimentary lunch or dinner entrée from a special menu. Veterans must provide proof of military service. Be sure to contact your local McCormick & Schmick’s as this is valid at participating restaurants only. Also, space is limited and reservations are highly recommended. Orange Leaf Frozen Yogurt: Free cup of froyo, up to 11 ounces. You will have a wide selection of flavors and toppings to choose from, including the limited time only froyo flavors, Pumpkin Spice Latte and the new Salted Caramel Latte. Outback Steakhouse: Free Bloomin’ Onion & Beverage at your local Outback Steakhouse on Wednesday, November 11, with valid military ID. And for the rest of the year, they are giving 15% off to military personnel—plus their families. Come in November 12 through December 31 to enjoy your discount, with valid military ID. If you are currently deployed you can still get yours, go here and fill out the form and they will give you a Veterans Day Rain Check for a free Bloomin’ Onion. It’ll be waiting for you, at any Outback Steakhouse in the U.S., when you come home. Ponderosa Steakhouse: From 4pm-close get a free Buffet meal. Red Lobster: From 11/9-11/11,Red Lobster is thanking active-duty military, actively serving, reserve and military veterans for their service with a no purchase necessary free appetizer or dessert offer. Guests may choose from a special menu. Rock & Brews: complimentary pulled pork sandwich with a side choice of natural fries, house potato salad, pasta salad or coleslaw throughout the day at all of its restaurants in the United States. Shoney’s: Is offering a free All-American Burger to all active-duty and veterans of the military on Veterans Day. Go here and get your coupon and then bring it in with you. Starbucks: Free traditional free tall-brewed coffee for active duty service members, veterans and military spouses. Starbucks will also donate $5 to the USO Transition 360 Alliance with every purchase in select stores. Texas Roadhouse: Pick one of the following meals for free, plus get a free drink. Tony Roma’s: Nov. 11, 2015. Free half rack Baby Back Ribs at select locations. For current and former military members with valid proof of service. Valid at select locations only. Please call ahead to verify participation. Warrior Project, an awesome military charity. White Castle: Get a free Breakfast Slider and a small coffee or a small soft drink. World of Beer: All veterans and current service members receive a free select draught beer on November 11. Alfred Angelo: Military brides get a free wedding gown on Veterans Day. An appointment to the store must be made for November 11 to qualify. Amazon: At Amazon, you can take 20% off select products in the store’s fashion department. This promotion applies to select clothing, shoes, watches and more, some of which are already discounted. Enter promo code 20VETERANS at checkout to have the savings applied to an eligible order. This code is valid through Nov. 11 at 11:59 p.m. PT. Bed Bath & Beyond: Home decorating is 20% more affordable for servicemen and servicewomen at Bed Bath and Beyond. Through Nov. 11, members of the U.S. military, veterans and military spouses can take 20 percent off their entire purchase (some exclusions apply). This promotion is available in-store only, and you must have your U.S. military ID present at the time of purchase. Carter’s: All shoppers can get in on the savings action this holiday with a 50% off sale at baby apparel retailer Carter’s. Price reductions can be found on apparel, shoes and accessories. Plus, through Nov. 11, you can print an in-store coupon or use promo code VETDAY25 online to take an extra 25% off a purchase of $40 or more. If you spend less than that, use code VETDAY15 to take 15% off your entire purchase. Dell: Former and current members of the military save an additional 15% on select PCs and electronics on November 11. Dollar General: Active duty service members, veterans and their family get an 11% discount on qualifying purchases on November 11. Eddie Bauer: Through Nov. 12, enjoy discounts up to 50 percent off on select products for men and women, plus gear. There’s no coupon required for this sale. Great Clips: On Nov. 11, veterans can get a free haircut at any U.S. Great Clips salon location. If you’re not a veteran, but get your hair cut at Great Clips on Veterans Day, the business will give you a “Thank a Veteran Free Haircut Card” that you can gift to a veteran in your life. Cards can be redeemed until Dec. 31. JCPenney: Current and former military personnel and their family members receive an extra 5% off in stores November 4-11. Little Bra Company: Save 15% during the month of November on all regular priced merchandise at The Little Bra Company when you shop online. Lowe’s: All veterans receive a 10% discount on November 11. The offer is available in stores only. Sears: Sears is getting in the patriotic spirit with a Veterans Day sale that runs through Nov. 14. You can score 40% or more off Kenmore appliances, an extra 20% off select sale and regular-priced purchases, and up to 60% off mattresses. Active duty, reserve and retired military personnel can save 40% off regular-priced tools and home appliances, an extra 10% off discounted tools and an extra 5% off discounted home appliances. Sleep Number: From October 19 through November 15, active and veteran military members will receive exclusive discounts on Sleep Number products. Save up to $700 on select Sleep Number mattress sets. Under Armour: Active duty, retirees and veterans get 15% off on all orders. World Market: Active duty, retirees, veterans, Reserves, Guard, DoD and spouses get 20% off entire purchase November 7-11. Army Corp of Engineers Recreation Areas: The U.S. Army Corps of Engineers will waive day use fees for veterans, active and reserve component service members, and their families at the USACE-operated recreation areas nationwide on November 11. B&Bs for Vets: Innkeepers are invited to participate in the 2015 B&Bs for Vets program by offering a minimum of one free room for one night on either November 10 or 11. Colonial Williamsburg: Active duty military, reservists, retirees, veterans, and their direct dependents receive free Colonial Williamsburg admission for Veterans Day weekend, November 6–11. Harley-Davidson Museum: The Harley-Davidson Museum is offering free admission to active military, veterans and their families on November 7, 8, and 11 in honor of Veterans Day. iPic Theaters: Former and current military members get a free ticket on November 11. Knotts Berry Farm: Knott’s Berry Farm is offering free admission for veterans and active duty military personnel and one guest, as well as 6 additional tickets for a discounted price from November 1, 2015 to December 20, 2015. LEGOLAND Florida: Veterans get free admission November 1-22, as well as 50% off tickets for up to six accompanying guests. National Parks: On Veterans Day, November 11, veterans will have access to over 100 National Parks that require entrance fees for free. Queen Mary: The Queen Mary offers free admission to active service members, retired military personnel, veterans and special discounts for their family members on November 11. Red Roof Inn: Red Roof Inn is offering 15% off stays in the month of November to veterans, active duty military and their families. Westgate Resorts: Starting November 11, the first 2,500 eligible service members who complete the online military appreciation form will receive a complimentary three-day, two-night vacation. Veterans who don’t qualify are eligible for a 25% discount. World of Coca-Cola: Active duty, reserves and retirees get free admission year-round, and November 5 through November 15, members of the Armed Forces may also purchase up to four half-price general admission tickets for their friends and family. « Who Knew a Hyundai Sonata Hybrid Could Look So Good? This is a great list! Thanks so much for putting it together! I’m so glad that so many businesses honor our veterans in this way!